Another innovation from the genius of SILFLOR®. 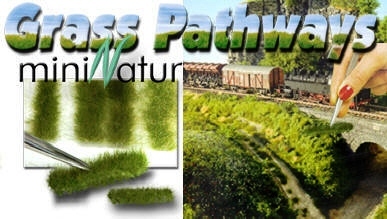 New Grass Pathways lets you create an incredibly realistic rustic dirt lane with minimal effort. SILFLOR® grass is mounted on a ultra-thin transparent base using the patented SILFLOR® process that allows the grass to stand up and feather outward just like the real thing. Each has sixteen 8½” strips. Available in 2mm and 4mm heights. All colors are compatible with our regular SILFLOR® mats. Grass Pathways are strips of fine rayon static grass adhered to a transparent base. Simply peel off backing sheet and break to random lengths and glue along side and center lanes. Blend with sifted soil or turf. SILFLOR® tips and idea booklet included.